After a very successful launch of his debut perfume – Moon Bloom, perfumer Hiram Green continues his explorations of natural fragrance ingredients. His latest research, inspired by chypres of Francois Coty resulted in creating a brand new composition called Shangri La. Inspired by the fictional land high in the Himalaya, described in “Lost Horizon” by James Hilton in 1933. With this perfume you are taken to a hidden paradise on earth where people live in beauty for ever. As soon as I apply Shangri La on my skin, I smell a very strong and intensive fragrance that instantly brings the impression of ylang-ylang to my mind. It smells so narcotic, as if these beautiful flowers, drenched in the tropical sunlight and overflowing with creamy and buttery layers, were growing right next to you. After a couple of minutes the saturation drops, the perfume becomes more harmonious and other notes begin to play. Among them is peach, which shortly comes to the front presenting its aromatic peel, which hides underneath a fruity pulp with distinctive lactonic vibe. I think that after 45 minutes Hiram Green Shangri La starts to smell of citrus. Ylang-peach combo with oakmoss is still pretty much around but now the smell of juicy lemons and oranges comes to the front, adding a nice and refreshing twist to this composition. There is also a hint of zest in here. At some point the fragrance transitions from rich and intensive floral to a more spicy concoction. There’s a lot going on here. Among spices I think I smell clove, cinnamon, possibly some pepper or nutmeg. This spicy blend adds some warmth to the structure of Shangri La, making it more complex, more complicated when you smell it after a while. This is a brand new idea from Hiram Green but at 2,5 hours mark the perfume reveals some parental bond with Moon Bloom. Both fragrances share (in my opinion) the same type of jasmine essence. Jasmine in Shangri La is really intense and rich. It’s also very dense, slightly indolic (veering towards smoky even) and incredibly delicious, with a jammy facet to it. You will want to eat it at the later stage. I really like the drydown of this composition. It offers a really varied experience. One moment you smell dusty aroma coming from oakmoss, the other one the fragrance is more indolic or creamy thanks to ylang-ylang and peach. Spices beautifully mingle in the background and when rose joins the composition and blends with jasmine, it smells to me like a home-made rose marmalade. It has that delicious, comforting and mouth-watering flavor. There is also a tiny bit of powdery iris, but it remains in the background. This perfume is all about indulging experience of ylang, peach, moss and jasmine. It’s like a drug, just like Moon Bloom. 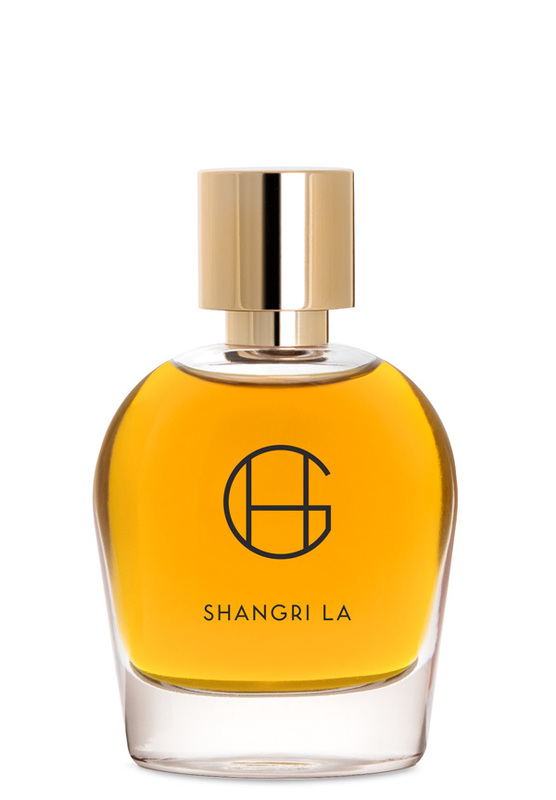 Shangri La by Hiram Green is a beautiful, rich and complex creation. It’s a very well-made homage to the classic values of true chypre accord. This is also a natural perfume, which deserves an additional ovation as it’s always harder to work with natural aroma materials. This fragrance is available in 50ml flacon with bulb atomizer and also as 5ml travel spray. On my skin it lasts for around 6-8 hours and after the initial blast it remains just a little bit above the skin. [note] sample was a courtesy of Hiram Green, thank you for sharing it with me. This has to be the most appealing perfume I’ve read about in a long while! Hooray for oak moss, which I like very much, and for all my other favourite notes that have been woven into this quite magical sounding fragrance. Some of your description makes me think of Vero Profumo’s Mito – is it a little similar? Mmmmmmm …. exotic ……… mmmmmm ….. lovely. Thank you. This may be the one that gets me back into loving perfume again. Hiram’s second effort is another wonderful composition. He really has talent and both perfumes are exciting and different. Nice review my friend. Hi Lucas, I have been wondering about Shangri-La and wanting to try it. I love ylang ylang and citrus, but I really dislike oakmoss notes. Is the oakmoss overwhelming? I will try this one, but I’m making myself go through all the samples I have first, before buying any more. 2015 is the year to get rid of excess “stuff.” I don’t know about the rest of the world, but Americans generally have far too many material possessions. At least I do. And I’m ready to be free of them, but it’s a process, sorting, making notes for tax deductions, selling on Ebay, etc. When I get through my current samples the two Hiram Green scents will be at the top of my test list. No, oakmoss is just an addition to Shangri La, sure it brings the typical note of chypre, but it’s ylang, peach and jasmine that lead this composition. I like both Shangri La and Moon Bloom. There are a lot of good things going on with both of them. Great review, Lucas! I have a sample of this, as of yet unsniffed. I think it will be right up my alley. I have a lot of respect for Moon Bloom, but tuberose is truly not for me. I thought I was up for the challenge, and I tried, I really did! So, I’m looking forward to this one! Thanks a lot. Since you have a sample, you should try it as soon as possible. I have similar feelings for Moon Bloom. Wonderful perfume, but I just cannot rock tuberose. What a beautiful review. I managed to get a sample of Moon Bloom for Christmas, but not Shangri La. I hope that I can get my hands on one at some point this year – it sounds really interesting. Thank you! How do you find Moon Bloom? Do you like it? You know, I do like it, but it wasn’t as mind blowing as I expected it to be after reading so many enchanting reviews about its wonderment. I definitely prefer diptyques Do Son edp – for me it is truly beautiful. But I shall continue to try tuberose scents as they come and see if any of them can knock Do Son off its pedestal! I see, I see. At least you have your favorite tuberose, so stick to that if you like Do Son so much. Wow, you make this sound like heaven on earth :-). I am looking forward to trying this! Great to hear it. 5 ml travel sprays sounds good, doesn’t it? While I applaud any brand that is sensible enough to release their perfumes in a very reasonable 5 ml size and I like your review, this brand clearly hates me: first they created a tuberose-centered perfume. Now peach… If the third one will feature cumin I’ll no for a fact that they are not for me 🙂 (though I still plan to try these both when I get a chance).